Street Views: 21, 86 and 7 Suppl. 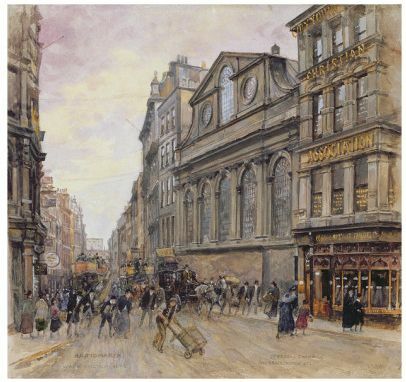 The large property where Robert Dever (or De-Ver) had his business as a cook and confectionary, was situated on the corner of Gracechurch Street and Cornhill and it was hence depicted in both Street Views. 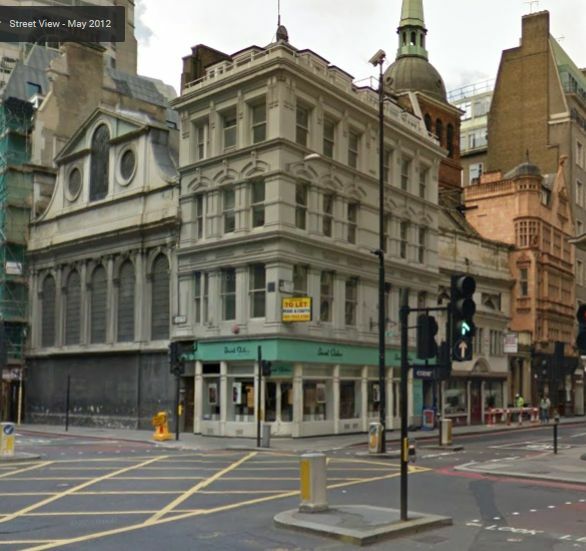 The elevation above this post is from Street View 21, that is the Gracechurch Street one, and shows the side of the building. 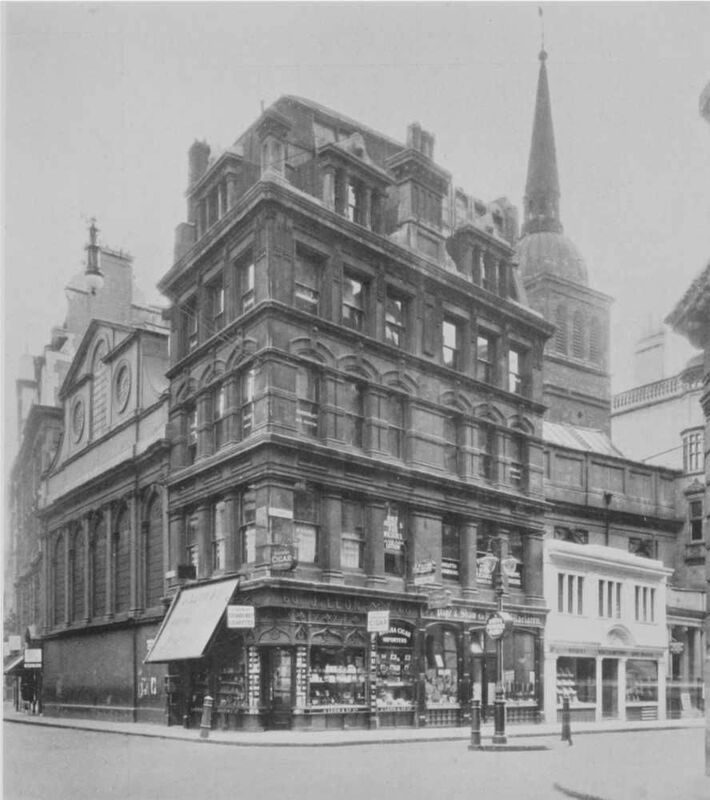 The Cornhill front was a lot larger and was depicted in Street View 86. 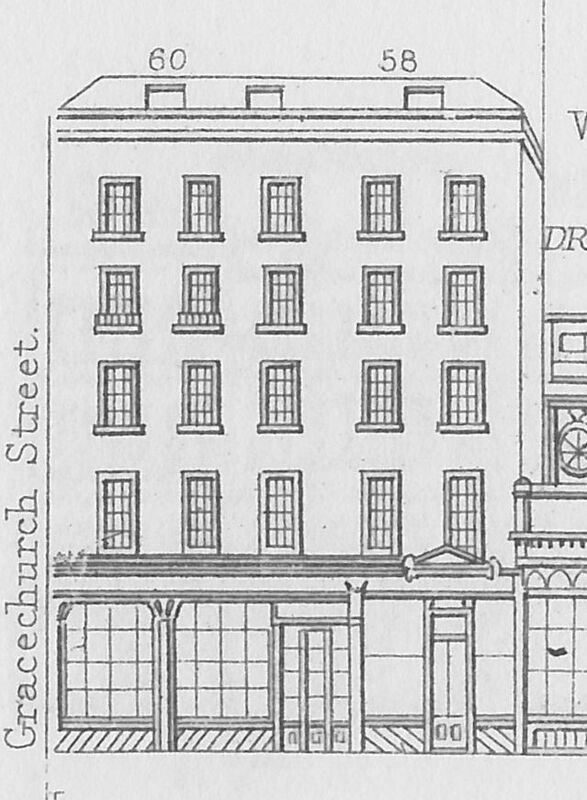 When Tallis produces his Supplements in 1847, the Cornhill front was once more depicted, but this time, the right-hand side of the building has acquired a new door and the number 58 above the building. I will come back to the numbering shortly. And if three depictions of the shop was not enough, Dever also paid for a vignette showing his shop situated against the church of St. Peter at Cornhill. 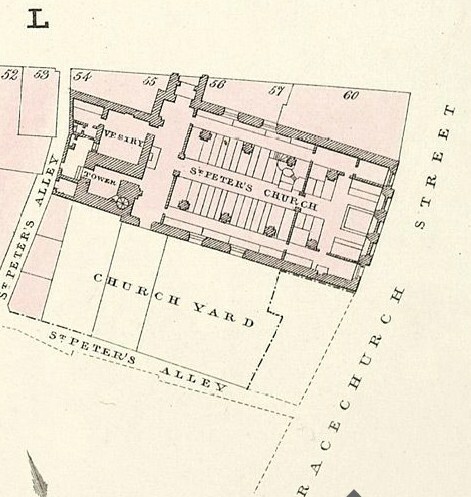 A map of the Cornhill Ward of October 1833 in the British Library, clearly shows how the building abutted the church. Number 60 is in the top right-hand corner. As the vignette shows, the shop had once belonged to Angell & Son and we will start the story with them. William Angell was baptised at St. Peter at Cornhill on 7 October 1733 as the son of John and Elizabeth. Fortunately, the record of the church gives the father’s occupation, cook, but alas not the exact address. William marries in 1759 and in 1767, his son William Sandell Angell, who was to take over the business, is born. William Angell senior dies in 1814 and leaves his property at Cornhill to William Sandell. In William’s will it is described as “the leasehold messuages or tenements and premises numbered 58, 59 and 60 situated in Cornhill aforesaid and now in the occupation of myself and my said son William Sandell Angell [space] Wilkinson and [space] Sanders”. 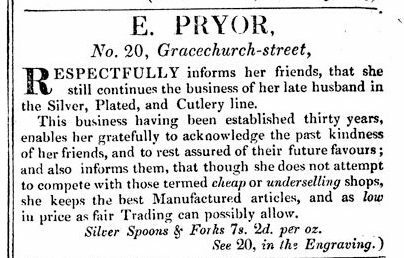 The Kent’s Directory for 1803 mentions one Robert Wilkinson, print seller, at number 58 and a William Sanders, fan-maker, at number 59, so large as the premises may look, it was not in the exclusive occupations of the Angell family, although it may have done so later. William Sandell’s son William Henry, receives his freedom of the Company of Cooks in 1823 and he presumably continued the family business. That is, until he died in 1834. 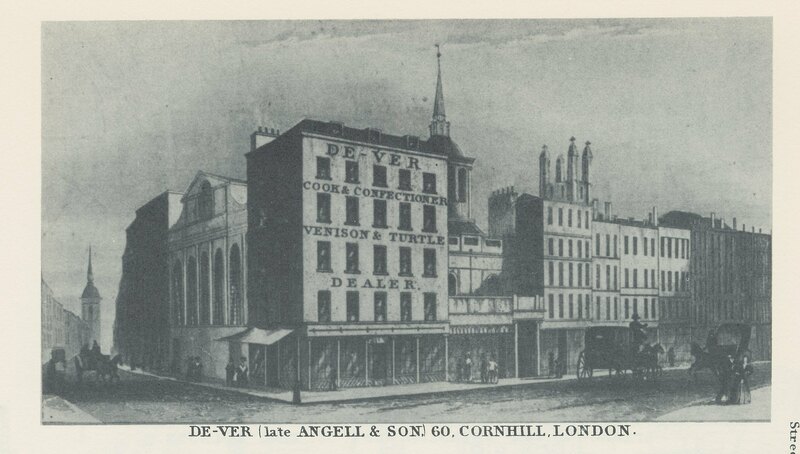 Whether Robert Dever immediately took over the shop from Angell after the death of William Henry, or whether William Sandell himself, or perhaps one of the other Angell sons, continued the confectionary business is not entirely clear, but Dever certainly obtained his freedom of the Company of Cooks in 1834 by redemption. 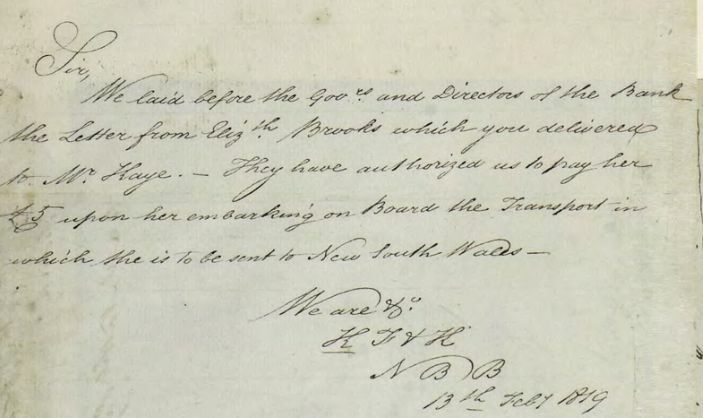 His name appears for the first time in the Land Tax register for Cornhill in 1836 with the name of Angell written behind his, perhaps to indicate a take-over halfway the tax period. Dever is listed for three properties, so I gather that numbers 58, 59 and 60 were then all three occupied by him and had for some time been by the Angells. 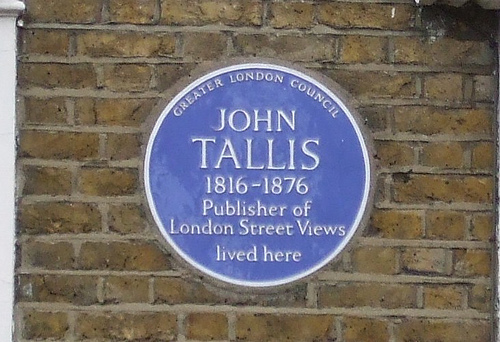 Tallis, in his first set of Street Views, does not mention numbers 58 and 59, but he does do so in the 1847 Supplement. Above the building is written 58, although the index lists Hyams, a jeweller at number 59. Will try and find out more about Mr. Hyams for a later post. What do we know about the food Angell and later Dever provided? 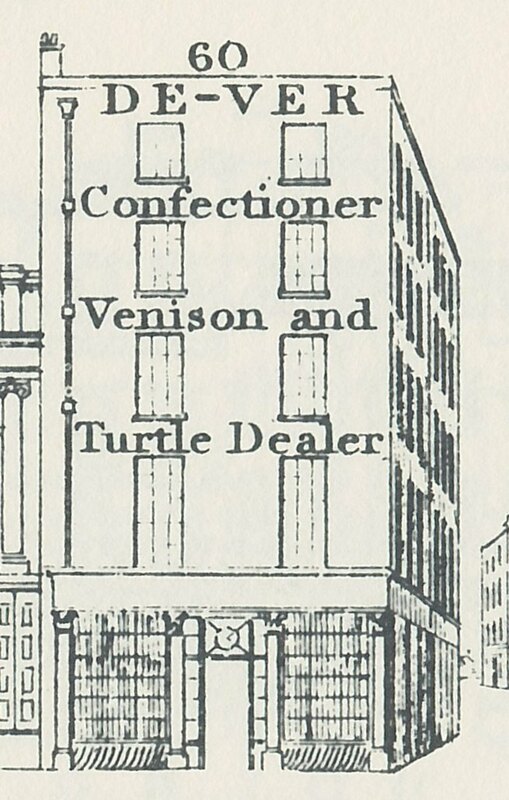 The elevation in Street View 21, calls Dever “Confectioner Venison and Turtle Dealer”. The vignette just adds the word Cook, but nothing else. The Morning Post of 18 Januari 1842, tells us that Dever provided a banquet at Mansion House which was “most sumptious”. That does not help us much, but The Standard of the same day printed the whole menu and French names were obviously quite in vogue; gelée au citron sounds much better than lemon jelly, does it not? In 1851, things went slightly pear-shaped for Robert and bankruptcy proceedings were filed against him. He seems, however, to have managed to survive and a certificate of the first class was issued by the Court of Bankruptcy. The Morning Chronicle not only reported on this fact, they also said that his debts were £7,000 and the assets already realised were £4,500. So, he could continue cooking and that is what he did. 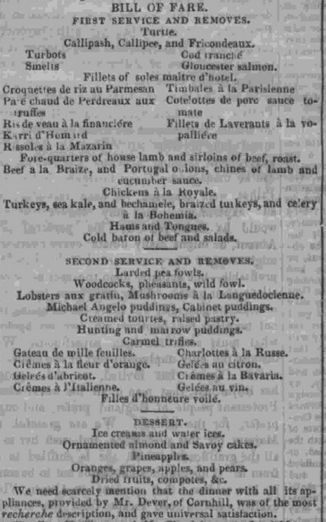 On 3 July 1856, the same paper mentioned him as the provider of “an elegant déjeuner” at the National Orphan Home. No menu provided by the paper this time, so no clue as to what the dignataries had on their plates. (1) England & Wales, National Probate Calendar (Index of Wills and Administrations), 1864. Probate of the estate, valued at under £3,000, is granted to his widow Mary. (2) Crossrail Bill, first special report, session 2006-07, Vol. 2, Oral evidence, 17 January to 23 March 2006. 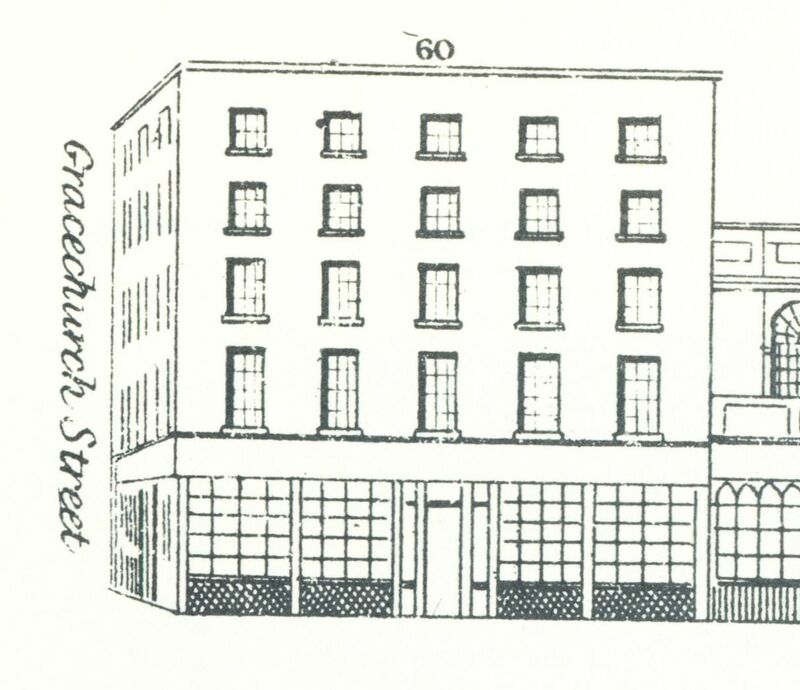 (3) The building is now occupied by David Clulow, optician, who lists it as 59, Cornhill.